Did you know that home eye injuries are more common than injuries at school or work? From cleaning the house to mowing the lawn, an eye injury can be a daily occurrence if one doesn’t take the right safety precautions. Fortunately, there are things you can do to protect your eyes and reduce the risk of injuries when performing daily activities at home. Wearing eye protection such as goggles is important in order to protect your eyes when doing tasks. They can prevent you from getting dust, chemicals and debris into your eyes. When using cleaning products such as cleaning sprays, bleach and detergents, make sure to follow use instructions, avoid mixing chemicals, and always use them in well-ventilated areas. Being careless with cleaning and chemical products can cause eye irritation and, in some cases, even lead to more serious consequences. Washing your hands is an important safety measure. It should be done after performing any house-related task, especially if you are going to be touching your face and eyes after. Touching your eyes with contaminated hands can lead to the spread of germs and could cause irritation. Cooking at home is a great way to stay healthy. However, without taking any safety precautions, one could easily compromise their eye safety. Avoid getting hot oil splashed on you by shielding your eyes with protective eyewear or covering skillets with a lid. Also, to avoid irritation, wash your hands after touching different foods and rinse thoroughly if something gets inside your eye. Whether you’re working indoors or outdoors, inspecting the area for dust and other particles can help maintain your eyes health. When using a lawn mower or a weed trimmer, use safety goggles or sunglasses to protect your eyes from grass and plant particles. The same safety measure applies to home repair tasks; always keep your eyes protected so that debris and loose materials don’t get in your eyes. Unfortunately, not all home injuries can be prevented. 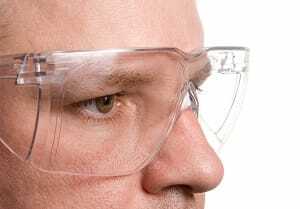 However, taking eye safety measures can help decrease the chance of getting injuries that could lead to more serious problems. For more information on eye safety, visit our website.